Bruce MacLeish Dern (born June 4, 1936) is an American actor, often playing supporting villainous characters of unstable nature. He was nominated for the Academy Award for Best Supporting Actor for Coming Home (1978) and the Academy Award for Best Actor for Nebraska (2013). His other film appearances include The Cowboys (1972), Family Plot (1976), Black Sunday (1977), Monster (2003), and The Hateful Eight (2015). Dern was born in Chicago, the son of Jean (née MacLeish; 1908–1972) and John Dern (1903–1958), a utility chief and attorney. He grew up in Kenilworth, Illinois. His paternal grandfather, George, was a Utah governor and Secretary of War (he was serving in the latter position during the time of Bruce's birth). Dern's maternal grandfather was a chairman of the Carson, Pirie and Scott stores, his maternal granduncle was poet Archibald MacLeish, and his maternal great-grandfather was Scottish-born businessman Andrew MacLeish. Dern's godfather was Illinois governor and two-time presidential nominee Adlai Stevenson II. His ancestry includes Dutch, English, German and Scottish. He attended The Choate School (now Choate Rosemary Hall) and the University of Pennsylvania. Dern starred in the Philadelphia premiere of Waiting for Godot. Dern appeared in an uncredited role in Wild River as Jack Roper, who is so upset with his friend for hitting a woman that he punches himself. He played the sailor in a few flashbacks with Marnie's mother in Alfred Hitchcock's Marnie. Dern played a murderous rustler in Clint Eastwood's Hang 'Em High and a gunfighter in Support Your Local Sheriff!. He also played cattle-thief Asa Watts, who murders John Wayne's character in The Cowboys (1972). Wayne warned Dern, "America will hate you for this." Dern replied, "Yeah, but they'll love me in Berkeley." Having played a series of villains, that same year he played against type as a sensitive ecologist in the science-fiction film Silent Running. He played a psychotic Goodyear Blimp pilot who launches a terrorist attack at the Super Bowl in Black Sunday. Dern was nominated for the Academy Award for Best Supporting Actor for Coming Home. In 1983, he won the Silver Bear for Best Actor at the 33rd Berlin International Film Festival for That Championship Season. In 2013, Dern won the Best Actor Award at the 2013 Cannes Film Festival for Alexander Payne's Nebraska, and was nominated for the Academy Award for Best Actor. Dern was married to Marie Dawn Pierce from 1957 to 1959. He then married Diane Ladd in 1960. Their first daughter, Diane Elizabeth Dern (born November 29, 1960), died at eighteen months from head injuries after falling into a swimming pool on May 18, 1962. The couple's second daughter, Laura (born February 10, 1967), is also an actor. After his divorce from Ladd in 1969, Dern married Andrea Beckett. Dern, Ladd, and their daughter Laura received adjoining stars on the Hollywood Walk of Fame on November 1, 2010. 2017 American Violence Richard Morton Timothy Woodward Jr.
Hickok Doc Rivers O'Roark Timothy Woodward Jr.
1960 Route 66 Albert Episode: "The Man on the Monkey Board"
1961 Sea Hunt FBI Agent John Furillo Episode: "Crime at Sea"
1961 Surfside 6 Johnny Page Episode: "Daphne, Girl Detective"
1961 Thriller Johnny Norton Episode: "The Remarkable Mrs. Hawk"
1961 Ben Casey Billy Harris Episode: "A Dark Night for Billy Harris"
1961 The Detectives Jud Treadwell Episode: "Act of God"
1963 Kraft Suspense Theatre Maynard Episode: "The Hunt"
1963 The Outer Limits Ben Episode: "The Zanti Misfits"
1964 77 Sunset Strip Ralph Wheeler Episode: "Lovers' Lane"
1964 The Greatest Show on Earth Vernon Episode: "The Last of the Strongmen"
1965 Rawhide Ed Rankin Episode: "Walk into Terror"
1965 Laredo Joe Durkee Episode: "Rendezvous at Arillo"
1965 A Man Called Shenandoah Bobby Ballantine Episode: "The Verdict"
1966 Branded Les Episode: "The Wolfers"
1966 The Loner Merrick Episode: "To Hang a Dead Man"
1966 Disneyland Turk Episode: "Gallegher Goes West: Crusading Reporter"
1969 Then Came Bronson Bucky O'Neill Episode: "Amid Splinters of the Thunderbolt"
1970 Land of the Giants Thorg Episode: "Wild Journey"
1970 The High Chaparral Wade Episode: "Only the Bad Come to Sonora"
1970 The Immortal Luther Seacombe Episode: "To the Gods Alone"
2003 King of the Hill Randy Strickland (voice) Episode: "Boxing Luanne"
2007 CSI: NY Vet Episode: "Boo"
^ "Actor Bruce Dern | Interviews | Tavis Smiley". PBS. January 15, 2014. Retrieved May 29, 2016. 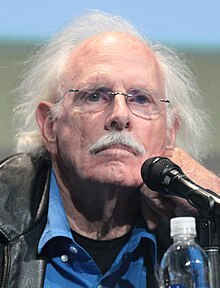 ^ "Bruce Dern Biography (1936-)". www.filmreference.com. ^ "John Dern, 54, Utility Chief, Attorney, Dies". ^ "New Again: Bruce Dern – Page". Interview Magazine. Retrieved May 29, 2016. ^ Borrelli, Christopher (November 11, 2013). "Bruce Dern's long run to 'Nebraska'". Chicago Tribune. ^ "Bruce Dern shows a dangerous streak in 'Big Love'". Los Angeles Times. January 13, 2010. ^ Bruce Dern was on Tavis Smiley recently and told the story of how Eleanor Roosevelt was not his godmother but a family friend whom his family visited at Hyde Park. "One year they were visiting and little Brucie got to go with them, and I was riding a bicycle in the afternoon, and ran into a tree and hit my head and had a concussion. In those days when you had a concussion they laid you down with your head on a pillow and then strapped your head across the pillow so you couldn't move it to the side or forward or anything. When I kind of came to, I guess it was late at night, 2:00 or 3:00 in the morning, and as I rolled my head to the side, I saw this lady's legs. They were kind of veiny, and had a nightgown down to about here with little kind of tacky slippers. (Laughter) I didn't understand. As I slowly came up and started looking up to where the woman's face was, she had a book in her lap, and she looked like this (makes face) and had that Roosevelt bite. I realized, my God, it's the president's wife. (Laughter) I had – it was just before he went to Yalta, so I would have been about eight, I guess. This was '44; I think that's when he went to Yalta. So that was in my house. Somebody took that and ran with it and assumed, well, who would babysit a guy like that unless it was his godmother?" ^ "Berlinale: 1983 Prize Winners". berlinale.de. Retrieved November 20, 2010. ^ "Cannes Film Festival: Awards 2013". Cannes. May 26, 2013. Retrieved May 26, 2013. ^ "Cannes: Lesbian Drama 'Blue Is the Warmest Color' Wins Palme d'Or". The Wrap. Retrieved May 26, 2013. ^ "The Artist's Wife - Celsius Entertainment - London - Film Sales".